Objectives: To report the clinical outcomes (early death, late death, and rate of reintervention) and performance of the Contegra conduit as a right ventricle outflow tract implant and to determine the risk factors for early reintervention. Methods: Forty-nine Contegra conduits were implanted between January 2002 and June 2009. Data collection was retrospective. The mean age and follow-up duration of Contegra recipients was 3.5 ± 4.6 years and 4.2 ± 2.0 years, respectively. Results: There were three deaths (two early, one late), giving a survival rate of 93.9%. The rate of conduit-related reintervention was 19.6% and was most often due to distal conduit stenosis. Age at implantation of <3 months, receipt of a conduit of 12-16 mm diameter, and a diagnosis of truncus arteriosus were each significant contributors to the rate of reintervention. Conclusion: The Contegra is a cost-effective and readily available solution. However, there is a limited range of larger calibers, which means that the homograft conduit (>22 mm) remains the first choice of implant in older children. The rates of reintervention are significantly higher with a diagnosis of truncus arteriosus, age at implantation of <3 months, and implantation of conduits sized 12-16 mm. Consequently, the debate on the Contegra as the long-term RVOT conduit of choice has not ended. In this article, we report on the outcomes of our population of Contegra recipients and scrutinize the influence of the patient's age, conduit size, and diagnosis on the risk of reintervention. This study was retrospective review of patient records, and echo and catheter lab reports from January 2002 to June 2009 and was approved by the research ethics board of the British Columbia Children's Hospital. The primary outcome measures were: Early mortality (death within 30 days post-op), late mortality (death after 30 days post-op), and freedom from conduit-related reintervention. Secondarily, we analyzed the proportion of conduit failure in two groups of recipients: Those <3 months of age at implantation and recipients of the smaller-sized conduits (i.e., 12, 14, and 16 mm). Finally, we also examined the diagnoses, reintervention rates, and time to reintervention of our patients, looking for patterns that could help predict their future needs, based on diagnosis. Statistical prediction of the lifetime of the conduit was performed using the Kaplan-Meier survival curves, with the single variable being time to reintervention. 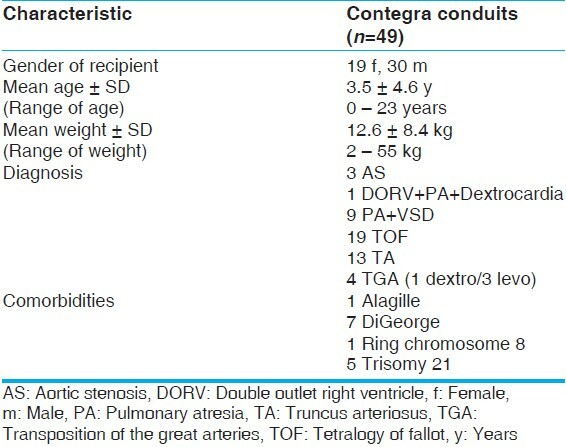 A total of 45 patients received 49 Contegra conduits between January 2002 and June 2009 [Table 1]. [Table 1] describes the population. For our secondary analysis, a division in the population was made at the age of three months at implantation, described in [Table 2]. We divided the groups based on conduit size into two categories: Smaller (12, 14, and 16 mm) and larger (18, 20, 22 mm) [Table 3]. The conduit size-based subpopulations were roughly equal in size and also had significant differences in age and weight at implantation (P<.05). Of the 49 Contegra recipients, 17 had had previous RVOT implants. Twenty-five patients had received a total of 31 palliative systemic-to-pulmonary shunts and eight patients had received six pulmonary angioplasties and three pulmonary stents. In the age-based subpopulations, of the six Contegra recipients under 3 months of age only one received palliation, a Blalock-Taussig (BT) shunt. They received a total of six conduits: Four 12-mm conduits, one 14- mm conduit, and one 16-mm conduit. The rest of the palliations and the remaining 43 conduits went to the older age-group. Because of the small sample size of the neonate population (n=6), no reliable statistical significance could be found between the palliation and implant sizes of the two groups. However, it is notable that neonates are usually not palliated and receive smaller Contegra conduits than older children by virtue of the fact that they are younger, smaller, and their diagnosis [which is predominately truncus arteriosus (TA)] requires earlier intervention. The conduit size-based subpopulations had no significant difference in systemic-to-pulmonary shunts received, but the larger conduit group was significantly more likely to have already had RVOT implant or pulmonary artery angioplasty (P<.05). The larger conduits are received by older, larger, children who are more likely to have already had one conduit in their lifetime and who are more likely to have branch artery stenosis from previous BT shunting. [Table 4] details the implant sizes, palliations, and procedures used in the total study population, the age-based subpopulations, and the conduit size-based subpopulations. Palliation is done to delay RVOT conduit implantation for as long as possible. The literature has identified young age, low weight, and small conduit caliber as risk factors for early reintervention. , In small children there is often a significant mismatch between conduit and artery diameters as the main pulmonary artery (MPA) is generally diminutive and the distal anastomosis is made with the branch pulmonary arteries. Therefore, every effort is made to allow the child to grow and receive the largest caliber conduit possible. All surgeries and follow-ups were performed at the British Columbia Children's Hospital. 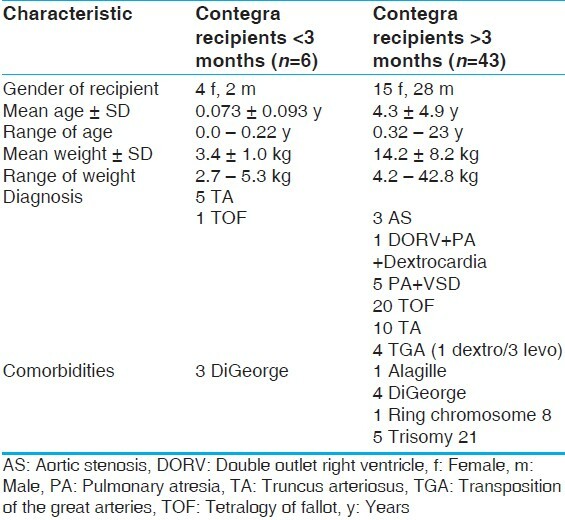 Indications for the use of the Contegra included: Tetralogy of Fallot (TOF) (n=19), with 12 patients receiving their first implant and 7 receiving replacements; TA (n=13), with 9 patients receiving initial conduits and the remaining 4 receiving replacements; aortic stenosis (AS) (n=3), with all patients receiving a conduit for RVOT reconstruction in the Ross procedure; transposition of the great arteries (TGA) (n=4) (1 dextro, 3 levo), one being used as replacement for a left ventricle-to-pulmonary artery (LVPA) conduit (levo-TGA), one was a new LVPA conduit, and two were replacements for stenotic right ventricle-to-pulmonary artery (RVPA) conduits; pulmonary atresia (PA) (n=9); and one case of double outlet right ventricle (DORV) with associated PA and dextrocardia. The mean cross-clamp time was 77 ± 54 minutes and the mean cardiac bypass time was 183 ± 83 minutes. The proximal end of the conduit was most often sewn directly into the right ventricle. Rarely, but whenever necessary, a pericardial patch was used to connect the ventricle and conduit to prevent a sharp angle and dynamic blockage. The distal end of the conduit was spatulated to ensure maximal diameter without distortion of the branch pulmonary arteries. The distal anastomosis was made to the pulmonary artery with 5-0 Prolene™ in running fashion, using partial thickness bites to minimize the leaching of preservative. No glue was used. There were two early deaths and one late death, giving a survival rate of 93.9% (46/49). No deaths were conduit related or intraoperative. Contegra death #1 (early) was an infant diagnosed with PA, VSD, undersized pulmonary arteries, and tracheal stenosis on the first day of life. He was palliated with a BT shunt for 6 months, at which time he underwent VSD closure, RVOT repair, stenting of the branch pulmonary arteries, and enlargement of the trachea with a pericardial patch. Post-op he was returned to the intensive care unit (ICU) in fair condition with minor bleeding. During the night, and then again the following morning, the patient experienced periods of cardiac arrest related to poor cardiac output. ECMO was initiated and the patient stabilized; however, a tracheal dehiscence occurred and the patient eventually succumbed. Contegra death #2 (early) was an infant diagnosed with aortic stenosis and coarctation after 2 weeks of life. The coarctation was repaired and an aortic valvotomy was performed. Six months later the child underwent a Ross procedure with a 16-mm Contegra implanted in the pulmonary position. The surgery was uneventful. However, there was ongoing bleeding, which was treated with recombinant factor VII. One hour post factor VII administration, the patient had a cardiac arrest and could not be resuscitated. Multiple antemortem clots were found within the coronary circulation at autopsy. Contegra death #3 (late) was an infant diagnosed with levo-TGA, PA, and VSD. He underwent a Rastelli operation, with implantation of a 16-mm Contegra in the LV to PA position. The surgery was uneventful and the patient was sent to the ICU in good condition and was subsequently discharged. The patient returned to hospital 5 months later, presenting with tachypnea. He was diagnosed with congestive heart failure and was continued on his normal drug regimen and observed. While in hospital-and not on telemetry-the child experienced a cardiac arrest and could not be resuscitated. At a mean follow-up time of 4.2 ± 2.0 years, the survivor population saw 15 surgical reinterventions in 13 patients. Nine of these reinterventions were indicated for conduit stenosis, with an average pressure gradient of 62 mm Hg across the conduit. Eight were explantations and one was an angioplasty. All eight conduits explanted were found to have partially or fully calcified valve leaflets and fibrotic tissue in the supravalvular region; three of the eight were also noted to have sites of ossification. We also found evidence of epithelioid giant cell immune response to foreign bodies in all eight. The nine revisited Contegra conduits were significantly smaller than the remaining 37 in the study population. 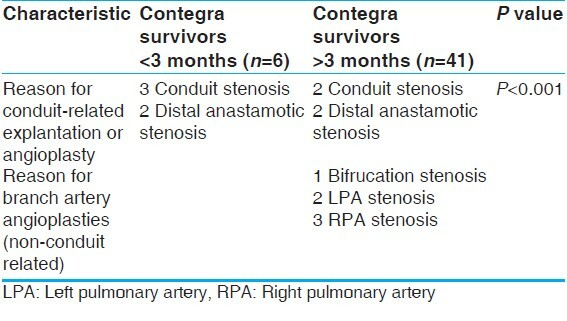 The remaining six reinterventions were angioplasties of the distal branch pulmonary arteries to correct for stenosis due to previous BT shunting or intrinsically diminutive branch arteries. Therefore, the surviving Contegra conduits saw a conduit-related reintervention rate of 19.6% (9/46), with an average time to reintervention of 2.9 ± 1.7 years. One in three conduits revisited the operating room or catheter lab (conduit and nonconduit related), with an overall time to reintervention of 2.5 ± 1.8 years. There was no increased risk of reintervention in those patients previously palliated with a BT shunt. [Table 5] describes the reinterventions in the survivor population. Our small group of newborns did show a high propensity to return for conduit revision. There were six children under the age of 3 months: Five TAs and one TOF. The TOF patient and four of the TA patients all returned for conduit-related reinterventions, generating a return rate of 83% (5/6), with a mean time to reintervention of 2.0 ± 1.7 years. 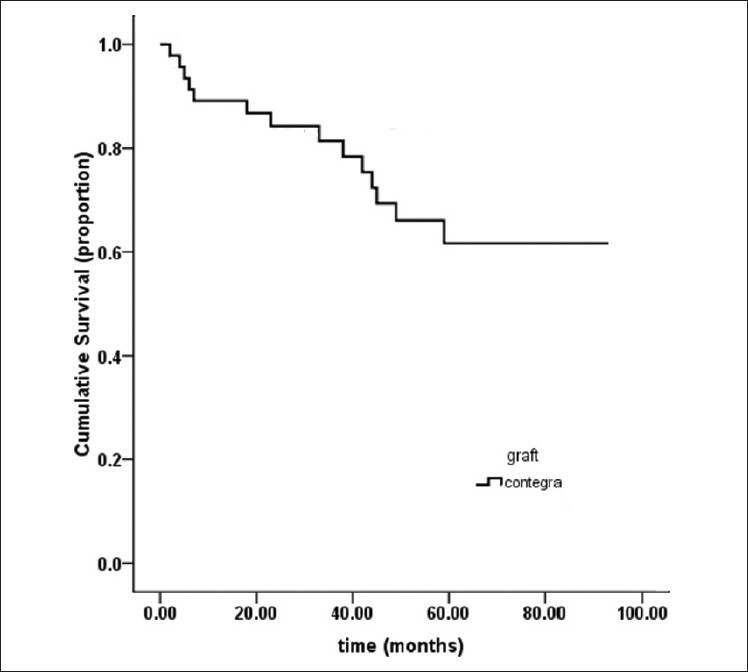 Contegra conduits in patients over 3 months of age returned at a rate of 9.8% (4/41), with a mean time to reintervention of 4.0 ± 1.7 years (P<.05). The difference between the two groups in time to reintervention was not significant (P>.05). [Table 6] describes the reinterventions of the age-based subpopulations. Our smaller-conduit recipients also had a high tendency to return for conduit revision. Six conduit-related reinterventions occurred in the 21 recipients (28.6%). Five of them had 12-mm conduits and the sixth had a 16-mm conduit. There were three reinterventions in the large-conduit group (12%), with all these conduits being of 18 mm size. This is a statistically significant difference in the rate of conduit reoperation (P<.05). The smaller conduits were also more likely to return sooner, with an average time to reoperation of 2.3 ± 1.4 years, while the larger conduits had an average time to reoperation of 4.80 ± 0.58 years (P<.05). [Table 7] describes the reinterventions in the two size-based subpopulations. The three major diagnoses in our Contegra recipient population were TOF, TA, and PA. There were 19 TOF, 13 TA, and 9 PA patients. The TOF group had an average age of 3.0 ± 4.1 years, and the TA group had an average age of 2.5 ± 3.0 years. The PA group, excluding the 220-year-old conduit revision, had an average age of 4.3 ± 5.5 years. The difference in the ages of these diagnostic groups were not significantly different (P>.05), but their rates of explantation were significantly different. Our infant TA patients were statistically more likely to return for conduit revision (P<.05). [Table 8] describes the reinterventions in the different diagnosis-based subpopulations. A Kaplan-Meier analysis of our Contegra population predicts a 60% freedom from explantation rate after 5 years [Figure 1]. Finding a conduit that is readily available, will grow with the patient, and elicit minimal immune response is difficult. The Contegra does well to fill this need. Our 46 survivors have performed quite well, with an explantation rate of 17.4% after a mean follow-up of 4.2 ± 2.0 years, that is, an observation period of 146 patient-years. This is concordant with the latest multicenter review performed by Breymann et al., who found a 19% explantation rate of their Contegra survivors after a mean follow-up time of 4.2 years, with an observation time of 687 patient-years. Supravalvular stenosis, either within the conduit or at the pulmonary anastomosis, was the single reason why a conduit was explanted. This is in agreement with the literature, which highlights the distal portion of the conduit as the problem zone. , Interestingly, our group of survivors saw no instances of aneurysmal dilatation. Perhaps this difference could be explained by a lack of homogeneity among the Contegra specimens or by the possibility that different centers tend to intervene at different RV pressures. It has been well recorded that infants and neonates return sooner for conduit replacement. , Studies have highlighted immune response, sternal compression, fibrosis, distal anastomotic stenosis, and somatic outgrowth of smaller conduits as potential complications that can degrade the conduit and raise right ventricle pressure. , However, based on our observations and pathology reports of the explanted Contegra conduits, we believe immune response, residual glutaraldehyde, and conduit-artery diameter mismatch to be the key causative factors for conduit failure. The usage of low-concentration glutaraldehyde is a crucial difference between the Contegra and the traditional homograft. Glutaraldehyde is a cross-linking fixative used to preserve the graft. It is toxic in high concentrations by causing host cell apoptosis. The host pulmonary tissue at the distal anastomosis of the conduit is exposed to low-concentration glutaraldehyde over a period of years. This explains the poor growth of host tissue at the anastomosis, and could also explain the shrinkage of the adjacent pulmonary tissue observed in some patients, which hastens stenosis and subsequent reintervention. In comparison, Gerestein et al. observed only one event of distal anastomotic stenosis as a reason for reoperation in their group of 297 homograft recipients (mean age: 18 years). Brown et al. who reported 'poor performance at midterm follow-up' of their homograft recipient population (n=117; mean age: 4.3 years), did not once attribute conduit failure or RVOT obstruction to distal anastomotic stenosis or stenosis of the host pulmonary tissue. From these observations, further investigations into the effects of low-concentration glutaraldehyde on human tissue, as well as assessment of the rinsing regimen, is warranted to find a solution to this common mode of Contegra failure. In hopes of improvement Gough et al. have reported a decrease in apoptosis when glutaraldehyde-fixed collagen matrices are rinsed with L-glutamic acid. Our 13 Contegra recipients whose conduits received the novel two-stage rinsing are being followed closely and hopefully we will be able to report favorable late outcomes in them. Statistically significant risk factors for future conduit revision are: Age at implantation of <2 months, a diagnosis of TA, and the use of smaller sized conduits (12-16?mm). It is worth noting that these risk factors cannot be mm). It is worth noting that these risk factors cannot be considered mutually exclusive, given that they define patient characteristics that are interlinked. To illustrate, TA patients often require intervention at an early stage. By virtue of this fact, these patients will have a lower age, weight, and size at implantation. Thus, the size of conduit they can receive will be diminished, putting them in a higher-risk category (12-16 mm conduit size). Consequently, they will return sooner than their peers for conduit revision. The diagnosis would certainly be the first risk factor to present itself, but being under the age of 3 months or receiving a smaller sized conduit would also hasten a conduit reoperation. Thus, we take a broad view of this trinity of risk factors; where the isolated presence of one is significant, but keeping in mind one is often accompanied by another. This study was not randomized and patient selection was based on availability, with the only inclusion criteria being a valved Contegra conduit in the pulmonary position. The range of follow-up time was also quite wide (0.8-7.6 years). To summarize, the Contegra conduit is a valid alternative to the homograft, and we encourage its use in children. In our population, only 19% of Contegra patients had their conduits replaced after 4.2 years of follow-up. If the graft does fail before somatic outgrowth demands its replacement, it will most likely be due to distal stenosis caused by immune response, leaching of preservative, and conduit-host size mismatch. To mitigate the effects of glutaraldehyde, thorough rinsing of the distal aspect of the conduit during implantation is encouraged. We would like to express our appreciation to Angie Kennedy, MSc., for her assistance with the preparation of this manuscript. 1. Ross DN, Somerville J. Correction of pulmonary atresia with a homograft aortic valve. Lancet 1966;2:1446-7. 2. Boethig D, Goeler H, Westhoff-Bleck M, Ono M, Daiber A, Haverich A, et al. Evaluation of 188 consecutive homografts implanted in pulmonary position after 20 years. Eur J Cardiothorac Surg 2007;32:133-42. 3. Tweddell JS, Pelech AN, Frommelt PC, Mussatto KA, Wyman JD, Fedderly RT, et al. Factors affecting longevity of homograft valves used in right ventricular outflow tract reconstruction for congenital heart disease. Circulation 2000;102:130-5. 4. Corno AF, Qanadli SD, Sekarski N, Artemisia S, Hurni M, Tozzi P, et al. Bovine valved xenograft in pulmonary position: Medium-term follow-up with excellent hemodynamics and freedom from calcification. Ann Thorac Surg 2004;78:1382-8. 5. Brown JW, Ruzmetov M, Rodefeld M, Vijay P, Darragh R. Valved bovine jugular vein conduits for right ventricular outflow tract reconstruction in children: An attractive alternative to pulmonary homograft. Ann Thorac Surg 2006;82:909-16. 6. Breymann T, Boethig D, Goerg R, Thies WR. The Contegra bovine valved jugular vein conduit for pediatric RVOT reconstruction: 4 years experience with 108 patients. J Card Surg 2004;19:426-31. 7. Boethig D, Thies WR, Hecker H, Breymann T. Mid-term course after pediatric right ventricular outflow tract reconstruction: A comparison of homografts, porcine xenografts and Contegras. Eur J Cardiothorac Surg 2005;27:58-66. 8. Boudjemline Y, Bonnet D, Massih TA, Agnoletti G, Iserin F, Jaubert F, et al. Use of bovine jugular vein to reconstruct the right ventricular outflow tract: Early results. J Thorac Cardiovasc Surg 2003;126:490-7. 9. Shebani SO, McGuirk S, Baghai M, Stickley J, De Giovanni JV, Bu'Lock FA, et al. Right ventricular outflow tract reconstruction using Contegra valved conduit: Natural history and conduit performance under pressure. Eur J Cardiothorac Surg 2006;29:397-405. 10. Meyns B, Garsse LV, Boshoff D, Eyskens B, Mertens L, Gewillig M, et al. The Contegra conduit in the right ventricular outflow tract induces supravalvular stenosis. J Thorac Cardiovasc Surg 2004;128:834-40. 11. Gober V, Berdat P, Pavlovic M, Pfammatter JP, Carrel TP. Adverse mid-term outcome following RVOT reconstruction using the Contegra valved bovine jugular vein. Ann Thorac Surg 2005;79:625-31. 12. Bautista-Hernandez V, Kaza AK, Benavidaz OJ, Pigula FA. True aneurysmal dilatation of a contegra conduit after right ventricular outflow tract reconstruction: A novel mechanism of conduit failure. Ann Thorac Surg 2008;86:1976-7. 13. Delmo-Walter EM, Alexi-Meskishvilli V, Abdul-Khaliq H, Meyer R, Hetzer R. Aneurysmal dilatation of the Contegra bovine jugular vein conduit after reconstruction of the right ventricular outflow tract. Ann Thorac Surg 2007; 83:682-4. 14. Rastan AJ, Walther T, Daehner I, Hambsch J, Mohr FW, Janousek J, et al. Bovine jugular vein conduit for right ventricular outflow tract reconstruction: Evaluation of risk factors for mid-term outcome. Ann Thorac Surg 2006;82:1308-15. 15. Lange R, Weipert J, Homann M, Mendler N, Paek SU, Holper K, et al. Performance of allografts and xenografts for right ventricular outflow tract reconstruction. Ann Thorac Surg 2001;71 (5 Suppl): S365-7. 16. Breymann T, Blanz U, Wojtalik MA, Daenen W, Hetzer R, Sarris G, et al. European contegra multicentre study: 7- year results after 165 valved bovine jugular vein graft implantations. 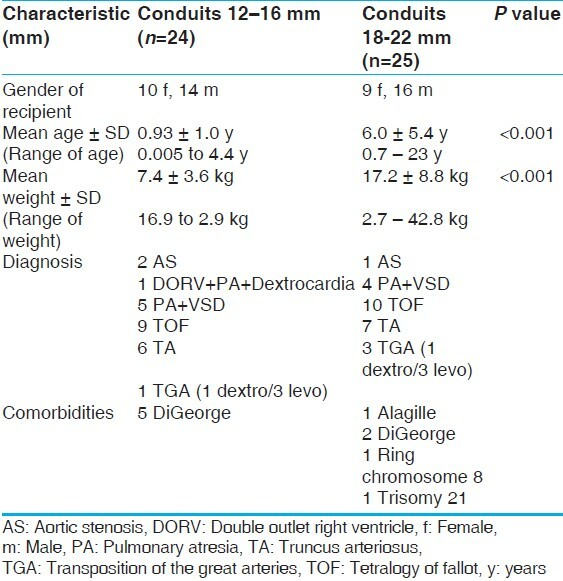 J Thorac Cardiovasc Surg 2009;57:257-69. 17. Wells WJ, Arroyo Jr H, Bremner RM, Wood J, Starnes VA. Homograft conduit failure in infants is not due to somatic outgrowth. J Thorac Cardiovasc Surg 2002;124:88-96. 18. Fiore AC, Ruzmetov M, Huynh D, Hanley S, Rodefeld MD, Turrentine MW, et al. Comparison of bovine jugular vein with pulmonary homograft conduits in children less than 2 years of age. Eur J Cardiothorac Surg 2010;38:318-25. 19. Gough JE, Scotchford CA, Downes S. Cytotoxicity of glutaraldehyde crosslinked collagen/poly(vinyl alcohol) films is by mechanism of apoptosis. J Biomed Mater Res 2002;61:121-30. 20. Gerestein CG, Takkenberg JJ, Oei FB, Cromme-Dijkhuis AH, Spitaels SE, van Herwerden LA, et al. Right ventricular outflow tract reconstruction with an allograft conduit. Ann Thorac Surg 2001;71:911-8. 21. Brown JW, Ruzmetov M, Rodefeld MD, Vijay P, Turrentine MW. Right ventricular outflow tract reconstruction with an allograft conduit in non-Ross patients: Risk factors for allograft dysfunction and failure. Ann Thorac Surg 2006;80:655-64. 22. Tiete AR, Schweh JS, Roemer U, Kozlik-Feldmann R, Reichart B, Daebritz SH. Right ventricular outflow tract reconstruction with the Contegra bovine jugular vein conduit: A word of caution. Ann Thorac Surg 2004;77:2151-6. 2 Does prolonged post-mortem cold ischemic harvesting time influence cryopreserved pulmonary homograft tissue integrity? 5 Polymer-Based Reconstruction of the Inferior Vena Cava in Rat: Stem Cells or RGD Peptide? Schiller, O., Sinha, P., Zurakowski, D., Jonas, R.A.
10 The Contegra bovine jugular valved conduit: Living up to expectations?